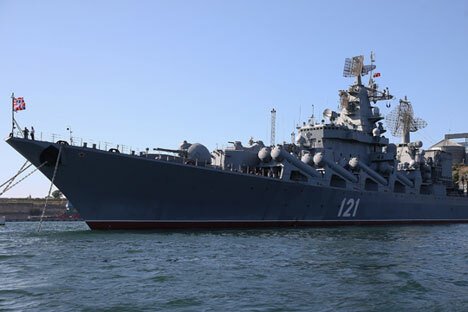 The flagship of the Russian Black Sea Fleet missile cruiser of the Guards (GRKR) "Moskva" in Sevastopol Bay. With the nature of warfare changing with evolving modern geopolitics, possessing high-precision missile assets at sea has become an integral part of U.S. and now Russian military strategy. A new generation of smaller ships is already paying off as Moscow’s military campaign in Syria demands precision strikes at long range. Russian Caliber cruise missiles were launched from the Caspian Sea at terrorist targets in Syria on October 7, 2015. Seemingly unremarkable small missile ships of the Buyan-M class that recently entered service in the Caspian flotilla delivered the strikes, controlling their flight over three countries and ensuring almost 100 percent accuracy on targets. The rockets deviated no more than two metres from their designated coordinates. Identical missiles were launched from the eastern Mediterranean on November 7, this time aimed at Raqqa, the northern Syrian capital of the self-proclaimed Islamic State (ISIS), which was still out of the range of Russian air strikes. Information about the operation was not released, but there are indications that the missiles could have been fired from the ultramodern Russian submarine Rostov-on-Don, while the Russian naval force was being covered by the missile cruiser Moskva, the flagship of the Russian Black Sea Fleet. The successes of the Russian navy in the Syrian campaign are largely a result of the latest developments in the domestic defence industry. When the Soviet Union collapsed in 1991, the most modern facilities for the construction of surface ships were located in the newly independent Ukraine. The most formidable ships of the Soviet fleet were built there, at the Nikolayev shipyard. The Moskva went down the slipway in Nikolayev in 1983 and went on to take part in active combat operations after 1991, when it was transferred to Russian ownership. Longer than two soccer fields, the Moskva has a maximum speed of 32 knots, carries helicopters and, crucially, can launch missiles. Its 16 Volcano anti-ship missiles can repulse almost any attack from the sea, ensuring the unhindered delivery of the type of strikes witnessed in Syria. But for all the Moskva’s formidable presence and might, new trends and developments in global military technology since it was built have shown that the era of giant surface ships has passed. The Russian navy is now focusing on a new type of vessel, and in recent years has commissioned a number of small missile ships that are not as fast as cruisers but are highly effective in other aspects. Carrying eight Caliber missiles as well as anti-aircraft systems, the Buyan-M class is a fearsome opponent in modern warfare. Several Russian enterprises currently build missile ships. The vessels of the Caspian Flotilla were built at the Zelenodolsk plant on the Volga River in the Republic of Tatarstan. The river serves as a transport artery that enables the shipyard to supply ships to the Black, Baltic and White seas. As well as missile carriers, Zelenodolsk produces hovercraft, landing craft, auxiliary ships and anti-submarine vessels. Patrol boats built here are also exported to a number of countries in Asia and Africa. Another shipbuilding enterprise that specializes in the construction of small military vessels is the Yantar (“Amber”) plant in Kaliningrad. After the city of Königsberg, now Kaliningrad, became part of the USSR after the Second World War, Amber’s engineers built more than 150 warships for the Soviet fleet, including large ocean-going vessels, anti-submarine and landing assault ships. Today the shipyard specializes in frigates and patrol ships, and 2010 saw the start of a new line of new frigates known as Project 11356. Its lead ship and the first to be launched, the Admiral Grigorovich, is armed with a range of missile systems, including the Caliber.